Bring on the pot. Filmmaker Paul Thomas Anderson is right in the middle of filming his next feature, Inherent Vice based on Thomas Pynchon's book, in Los Angeles with Joaquin Phoenix, Josh Brolin, Jena Malone and Benicio Del Toro. PTA is known for his beautiful cinematography, and often uses stunning, long tracking shots in his films. A tracking shot is a smooth follow-along, and is called a "tracking" or "dolly shot" because the camera is mounted on a cart that glides on rails. PTA blog Cigs & Red Vines is posting behind-the-scenes photos, the latest showing 470 feet of track laid out. A quick but exciting look at making movies. 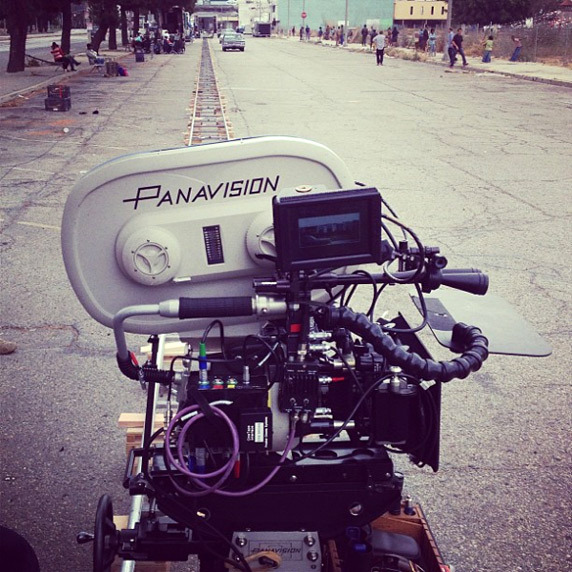 Here's the first photo from Cigs & Red Vines on Facebook: "470 ft. of dolly track on the set of Inherent Vice"
And the second shot posted late July showing PTA himself holding a camera: "man with a movie camera…"
Described as "a Cheech and Chong movie", Inherent Vice is an adaptation of Thomas Pynchon's novel about stoner private eye Doc Sportello in a 1970's "part noir, part psychedelic romp" detective story. It sounds like something totally different from PTA, almost closer to his roots of Boogie Nights than The Master or There Will Be Blood, but it should be fun anyway. Cigs & Red Vines also confirmed that cinematographer Robert Elswit, who won an Oscar for There Will Be Blood and worked on all of PTA's past films but did not shoot The Master (Mihai Malaimare Jr. did), will be back as DP for Inherent Vice. Warner Bros, producing and distributing the film, is planning a mid-to-late 2014 release for PTA's Inherent Vice, but no date is set yet. nice to see a filmmaker still using film. As does Quentin Tarantino. Still, using film has almost become a novelty these days, which is tragic. And that's also why seeing influential directors like PTA using film leaves a glimmer of hope for the medium. Can't wait for Inherent Vice; it actually sounds a bit like a Big-Lebowski-esque drama if that makes sense. Dude, Saving Private Ryan is from 1998. You can't pretend like there's just as many directors using film as digital today. It's unfortunately just not the case. JENA MALONE is in it, yeah!!!!!!!!!!!!!!!!!!!!!!!!!!!!!!!!!! !